This is my character sheet, or design specification, for the apostle James/Cleopas (son of Alphaeus). The purpose of this sheet is to keep a record of the attributes or characteristics of my drawing, so that I can draw a similar-looking cartoon in all future scenes including James/Cleopas (son of Alphaeus). I first drew my version of James/Cleopas (son of Alphaeus) in March 2009, very early on in the history of Bible Cartoons. Those early pictures were for stories found in John’s gospel. By formalising my ideas on a character design sheet in this way I would have a simple and accessible design reference point, which would remind me of what I had drawn in previous cartoons. By referring to this sheet every time I drew a scene including James/Cleopas (son of Alphaeus) I hoped I would be able to draw and colour him to match previous cartoons, ensuring great similarity and therefore continuity between Bible Cartoons featuring James/Cleopas (son of Alphaeus), even if these cartoons were drawn months or even years apart. 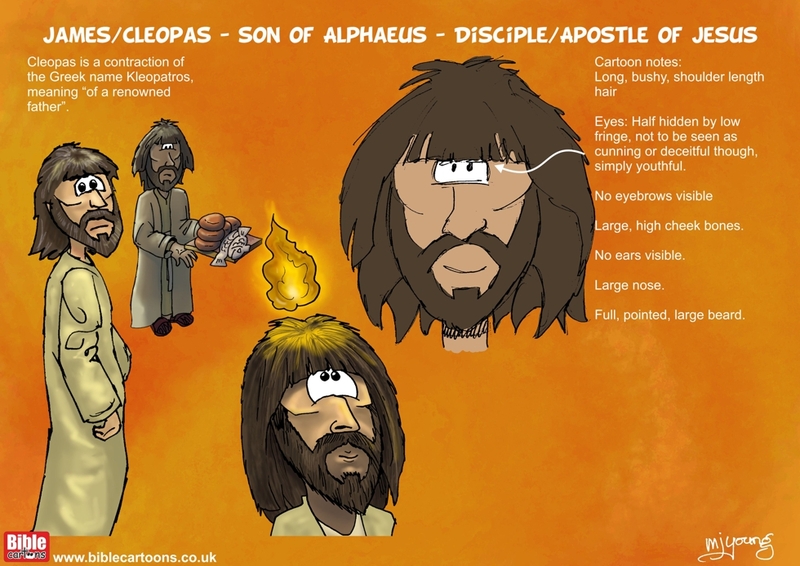 Without this character sheet to refer to I might very well accidentally draw a scene where the James/Cleopas (son of Alphaeus) character is quite different from previous drawings, which would be a problem if someone views and/or buys several Bible Cartoons and the same person looks quite different in each scene! There is a very real danger of this happening since my abilities and style gradually change and evolve over time, especially as I learn new art techniques and want to incorporate new ideas into my Bible Cartons. By referring to the character sheet I can be confident that I will draw a similar-looking person, even if my artistic skills have undergone change and development over time. Cleopas is a contraction of the Greek name Kleopatros, meaning “of a renowned father”. Very little is known about this disciple and apostle. It is not certain that he was the Clopas of John 19:25, or the Alphaeus of Matthew 10:3, although he may have been. He was one of the two disciples who were on the road to Emmaus on the day of Jesus’ resurrection (Luke 24:18). Jesus questioned them regarding the subject of their conversation and expounded to them the Scriptures that foretold Jesus’ sufferings and glory. During the evening meal, they recognised Jesus and then they hastened back to Jerusalem and told the other disciples all that they had seen and heard.